Five Hikes in Five Weeks included a variety of family-friendly hikes from easy to challenging that visitors can return to later. 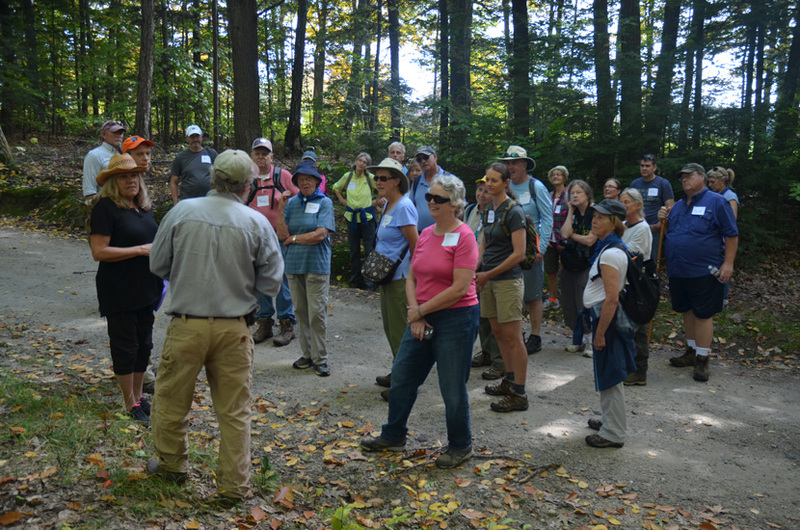 This summer and fall, the Forest Society partnered with WMUR to offer a series of guided hikes on our forest reservations. The 2018 series was modeled after our similar "5 Hikes in 5 Weeks" programs in Winter/Spring and Summer 2017, with the goal of introducing hikers of all abilities to Forest Society properties with reasonably challenging (but not overwhelming) trail systems that possess excellent views or interesting destinations. Beginning in late June and wrapping up at the end of October, we hiked to great views and followed the foliage transformation from the North Country to the southernmost parts of the state. "I don’t have a lot of chances to take time for myself. This hike resurrected my desire for ME TIME." "I loved learning about the history of the land - the guides did a fantastic job with that!" In a follow up survey, 64% of people who attended a hike said that discovering a new hiking destination was one of the reasons they joined the hike. About 73% of attendees were looking for a way to get some exercise. Others commented that they felt safer hiking with a guide. "I enjoyed the experience of visiting a new forest location in NH that is a different habitat than my own area." 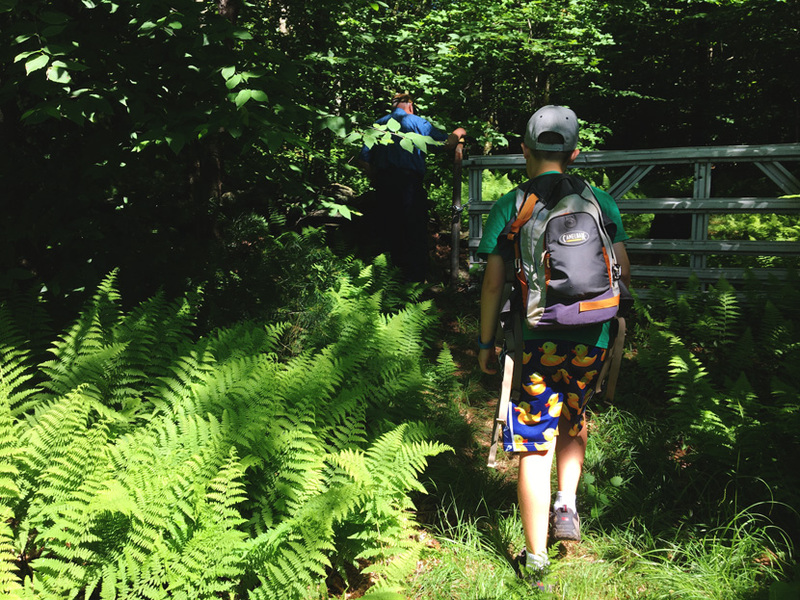 "Loved the hike and now that we have a trail map we'd like to explore further!" In many cases, hikers talked about wanting to return with their children, grandchildren, and other family and friends to see the forests and trails. Some want to see the sites in other seasons. Others were excited to recommend these properties to friends. Now we're sharing the whole list of 2018 hike locations so you can visit these unique destinations on your own time. Explore each of the 10 properties and get tips for visiting by scrolling below or clicking the hike name to jump to its section. 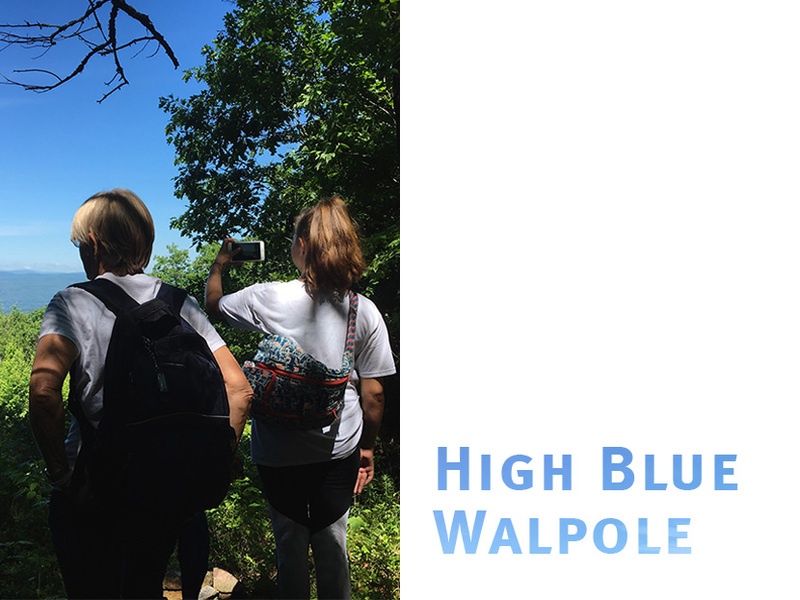 Fun Fact: High Blue features the highest point in the town of Walpole - 1,650' in elevation. Tips for Visiting: To get to High Blue, look for Forest Society logo signs at the end of Scovil Road in Walpole, NH. A hike of about 2 miles over rolling terrain is marked by blazes. This property does not have a detailed Forest Reservation Guide map (coming in 2019). Unless you are comfortable navigating in the woods, you may wish to consider exploring one our Featured Properties, which typically offer parking and a more detailed map. Ferns were prominent in late June on the trail at High Blue Reservation in Walpole, NH. Photos by Carrie Deegan. Hike Highlight: Seeing the features that would otherwise be hidden during high tide along Sagamore Creek. 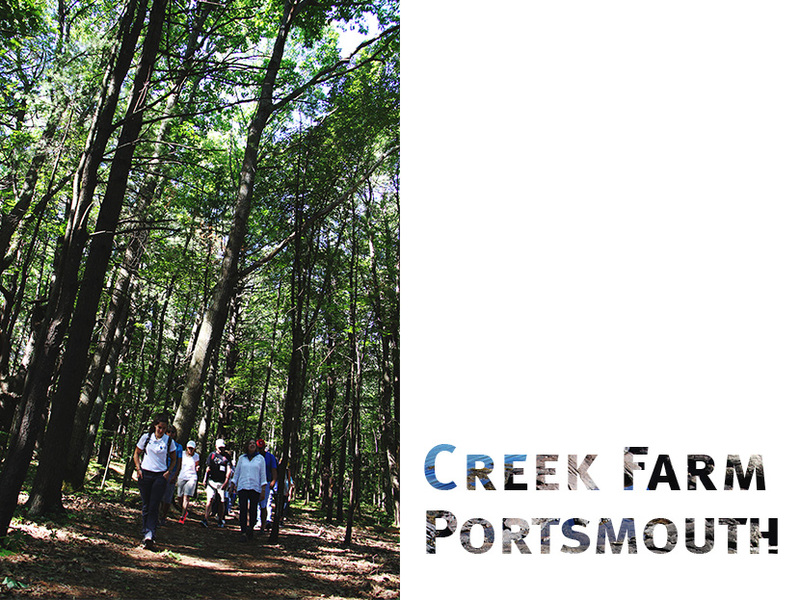 Fun Fact: Creek Farm is only minutes from downtown Portsmouth and a trail system connects to the neighboring Wentworth-Coolidge historic site and City of Portsmouth conservation land. Tips for Visiting: Parking is available dawn to dusk at the Carriage House at the end of the drive for 400 Little Harbor Rd. A short trail around the property follows the shoreline past a canoe/kayak launch and a man-made tidal pool. Learn more about the trees on the property with NH Forest Explorer, a web-based tralis app that displays interactive maps using the browser on your smartphone. Register for free to try Forest Explorer on the Little Harbor Loop trail. Please note that dogs are not permitted on the Creek Farm Reservation or the Wentworth-Coolidge historic site. 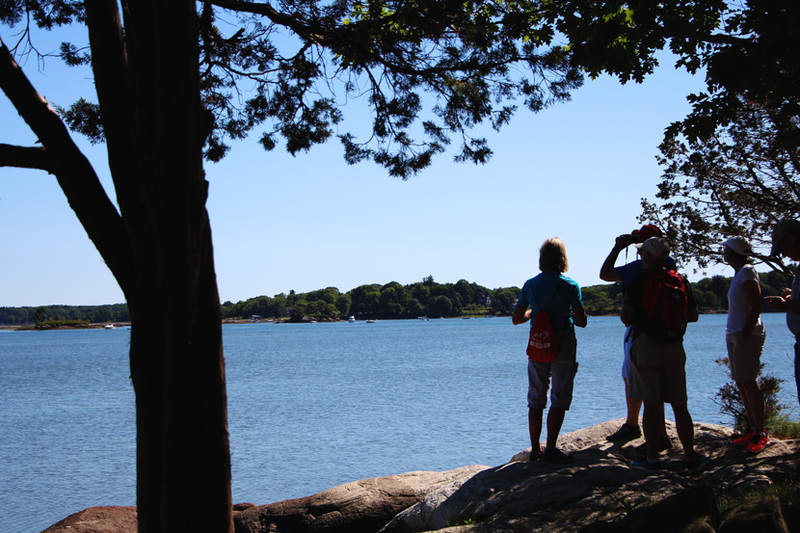 Visitors enjoy the view of Little Harbor in Portsmouth, NH from the Forest Society's Creek Farm Reservation. Creek Farm photos by Kirsten Gehl. Hike Highlight: Discovering historic features like cellar holes, 19th century roads, and stonewalls from the former hill farm. 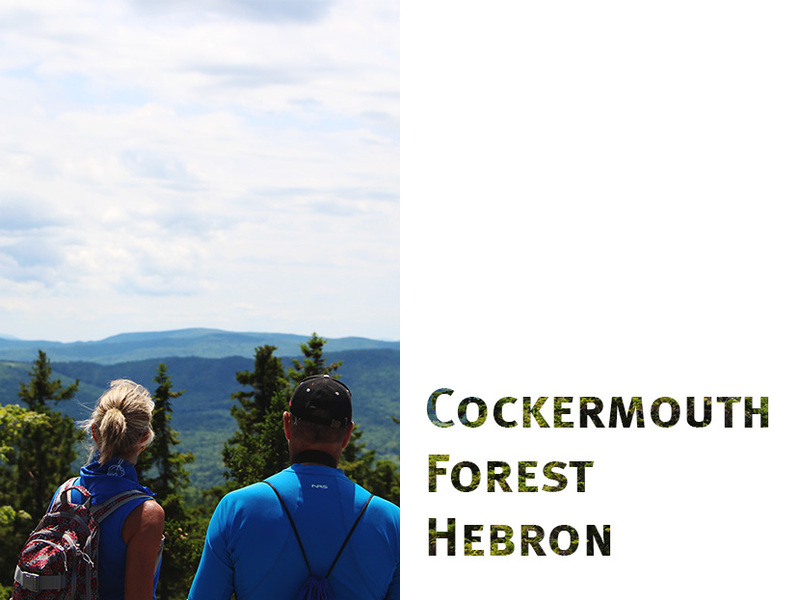 Fun Fact: The trail network at Cockermouth Forest connects to Crosby Mountain State Forest where you can hike to two summits: Bald Knob (2,035') and Crosby Mountain (2,222'). Tips for Visiting: There is a property sign, “Cockermouth Forest: John F. Woodhouse Trail” at the entrance. Follow a 300’ fairly passable road into a small parking area. Please don't block the gate when parking. Please note that the Forest Society does not plow or guarantee access to this property or the parking area during the winter. North Groton Road has “no parking” signs on the east side of the street. 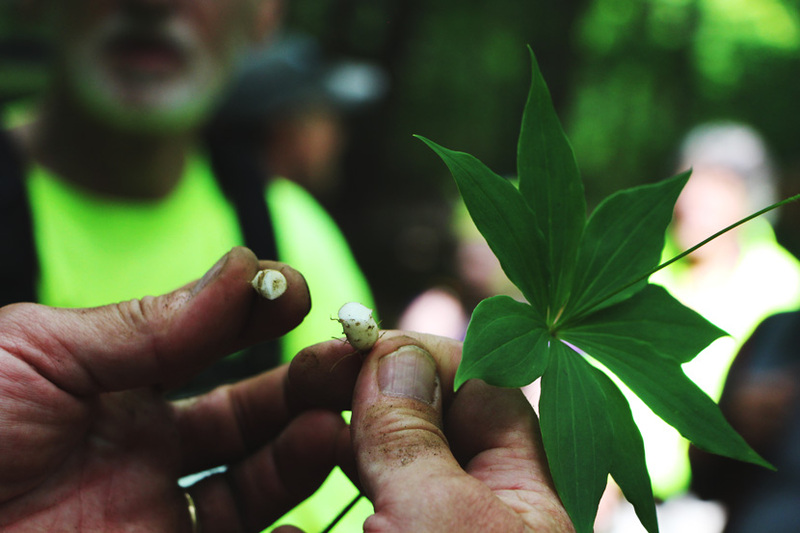 Hikers examine the inside of the edible portion of a cucumber-root plant, Medeola virginiana. Cockermouth Forest photos by Kirsten Gehl. 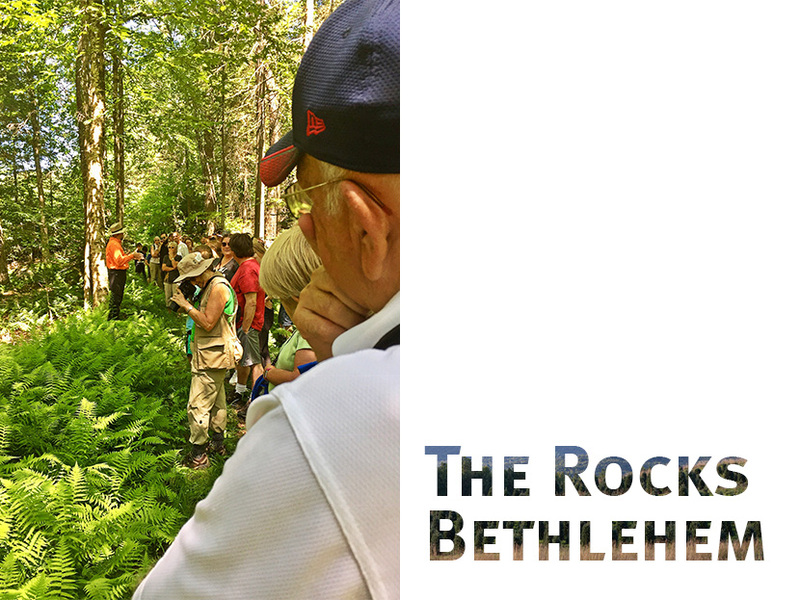 Hike Highlight: Learning more about all the different habitats at The Rocks and the wildlife that tend to frequent them. Fun Fact: The Forest Society offers a host of other activities at The Rocks which serves as our North Country Conservation & Education Center throughout the year, from the popular springtime Maple Tours to various natural history talks. Check The Rocks calendar for upcoming events. Tips for Visiting: The Rocks has plenty to explore no matter the season. The trails are open daily, year-round, from dawn to dusk. Maps are available online or at the information kiosk adjacent to the parking lot. Please note that dogs are welcome to accompany their humans on the trails, although we ask that you keep them leashed until you're on the trail. Hikers walk past rows of Christmas trees at the Rocks in Bethlehem, NH. The Rocks photos by Rich Montone. Hike Highlight: Seeing the centuries-old black-gum swamps. 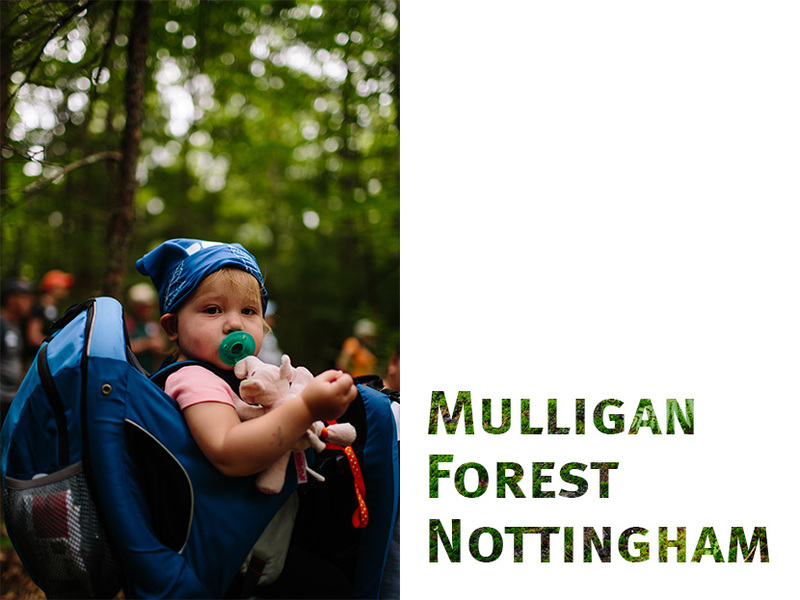 Fun Fact: Mulligan Forest is a 2,027-acre working forest owned by the Fernald Family and is open to the public for low impact recreational and education use. The Forest Society holds a conservation easement on the land with the Town of Nottingham. Conservation easements keep land permanently undeveloped, while allowing management for forestry, wildlife, agriculture, and recreation. Tips for Visiting: A parking area on Stevens Hill Road is maintained for three-season walking access to Mulligan Forest. Download the trail map and read more about recreational uses on the property here. Please note the parking area is not plowed or maintained during the winter. 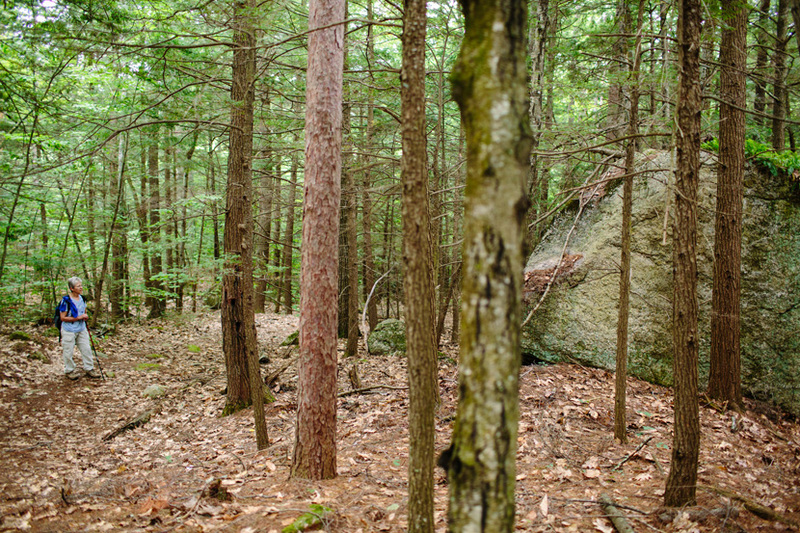 There are many features of interest like this glacial erratic along the trails in Mulligan Forest in Nottingham, NH. Mulligan Forest photos by Emily Lord. Hike Highlight: The sweet treat of honoring the White Mountain National Forest's 100th birthday with cupcakes and apple cider before the hike through the gorge! 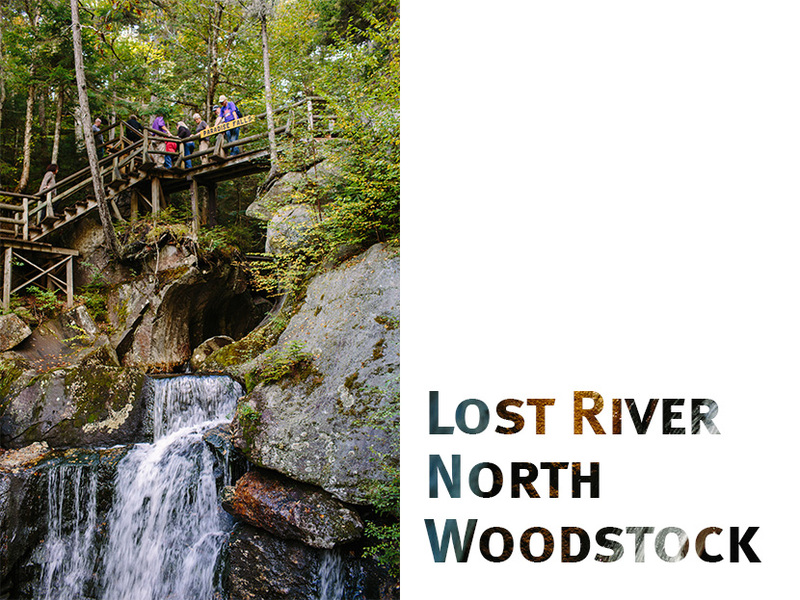 Fun Fact: Lost River is the Forest Society's oldest continuously held reservation. In the early 1900s as the logging increased in the area and threatened the beauty of Lost River Gorge and the surrounding area, there was a need to protect this natural wonder. We recognized that need and purchased Lost River in 1912. Still owned by the Forest Society today, the property is leased and operated by the White Mountains Attractions Association. 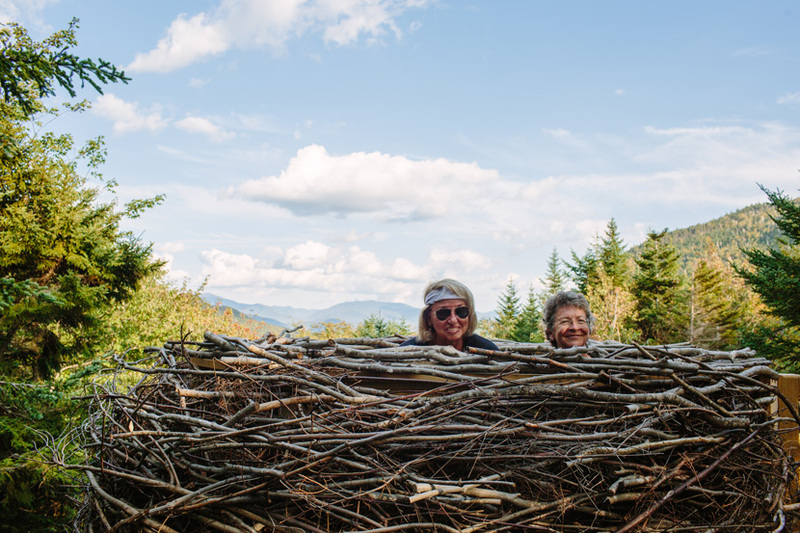 Hikers check out "the bird's nest" at Lost River Gorge featuring spectacular views of the White Mountains National Forest. Lost River photos by Emily Lord. Hike Highlight: Taking in the views from Pheobe's Nable (1,185') while enjoying lunch. 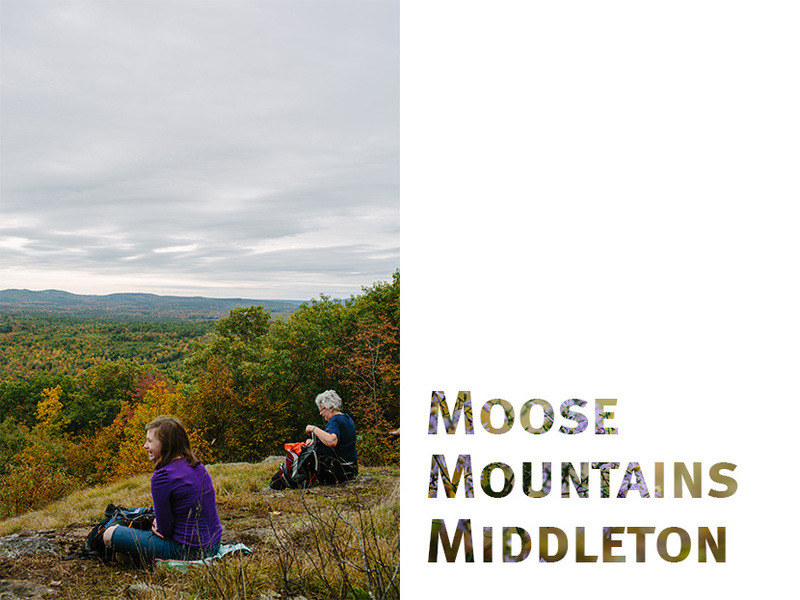 Fun Fact: There are more than eight miles of trails to explore at the Moose Mountains Reservation! The trails are combination of foot paths, woods roads, and snowmobile trails. Tips for Visiting: A small parking area and kiosk at the end of New Portsmouth Road mark the main entrance to the property. There are many trails to choose from! Many hikers choose to start with a 2.8 loop using the Phoebe's Nable trail and the Burrows Farm Trail. You'll get to see views to the south on Phoebe's Nable, hike through forests and fields, and pass by an old cemetary and a stream. Please note that the parking area is now plowed during the winter and the town does not allow parking along New Portsmouth Road. Find more tips in the Moose Mountains Reservation Facebook Group. 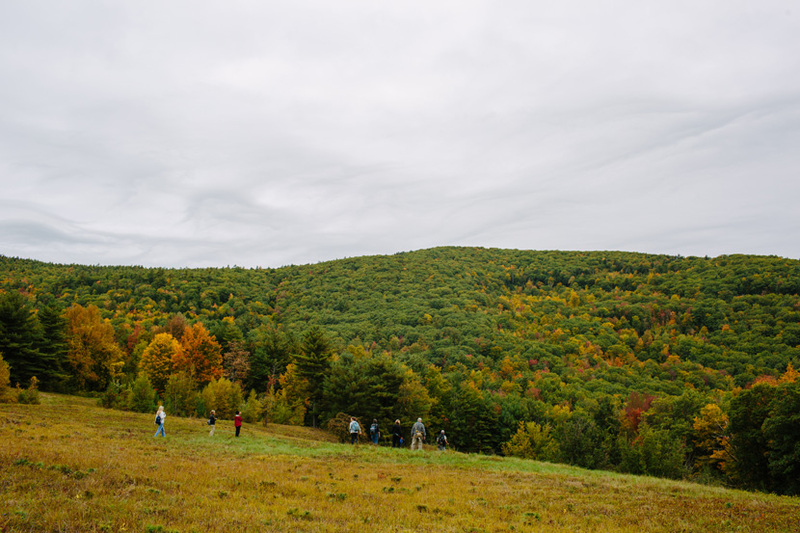 Hikers follow the trail through field that was part of the old Burrows Farm at Moose Mountains Reservation in Middleton, NH. Moose Mountains photos by Emily Lord. Hike Highlight: Hearing from the managing forester about the working forest on the property, including how and why trees were harvested. Fun Fact: Muster Field Farm is a working farm and museum. The large, flat and open fields, where militias mustered during the 18th and 19th centuries, are used to demonstrate farm operations and equipment during Farm Days in August. Over 200 of the museum's 250 acres are under a conservation easement with the Forest Society. Tips for Visiting: Muster Field Farm Museum welcomes visitors anytime, during any season. Pets are allowed on leash and parking is in front of the Ryder Schoolhouse (near the museum entrance), or along Harvey Road. 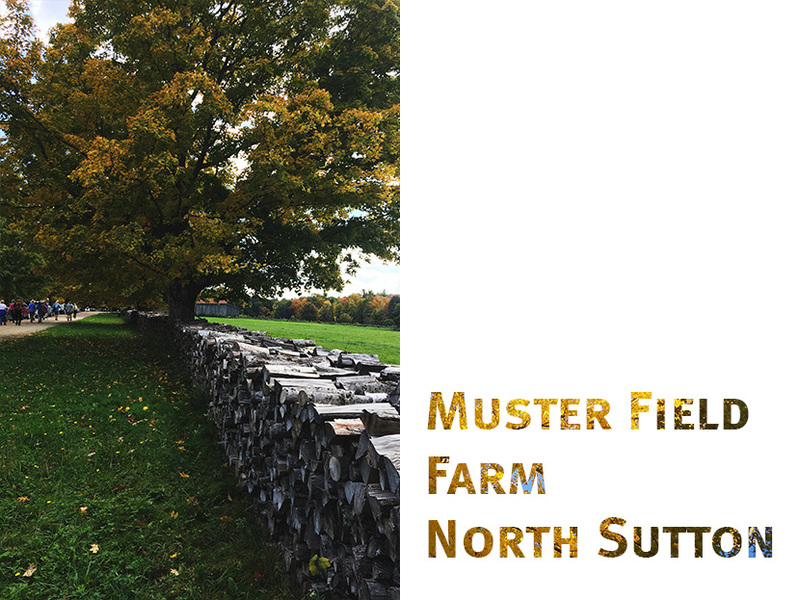 Check out the Muster Field Farm website for more visitor information. Hikers hear from forester Tim Wallace of River Edge Forestry. Muster Field Farm photos by Carrie Deegan (top) and Mike Carrafiello (above). 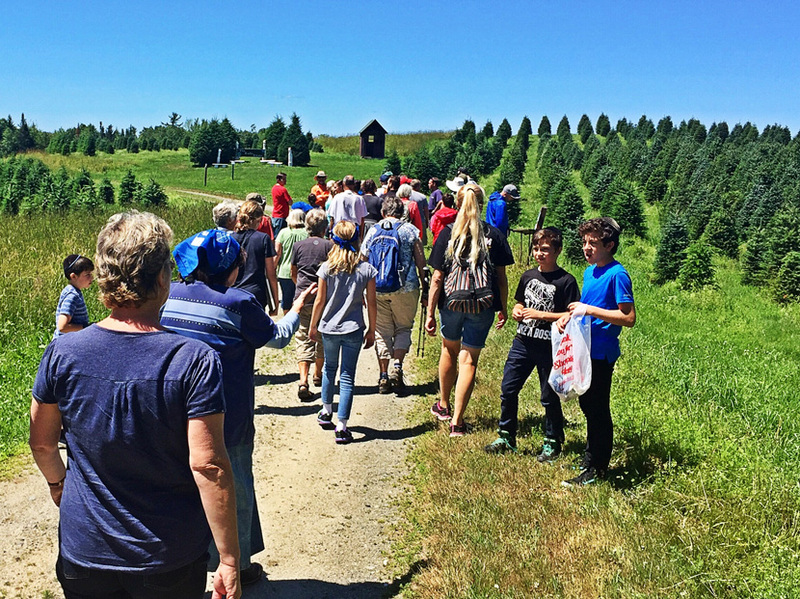 Hike Highlight: History buffs loved hearing about the interesting natural and cultural history of Monson Center. Fun Fact: Monson was an early colonial settlement that existed from 1737-1770 and covered over 17,000 acres. It was part of the British Empire (The Massachusetts Bay Colony) at its inception. The center of town, main roads, and several foundation holes remain. Tips for Visiting: Parking for a few cars is provided on Adams Rd. in front of the gate. A kiosk is located a few hundred yards down the road into the property, where the forest opens up to fields. Major trails are former roads (E. Monson Road and W. Monson Road), so they are quite wide. 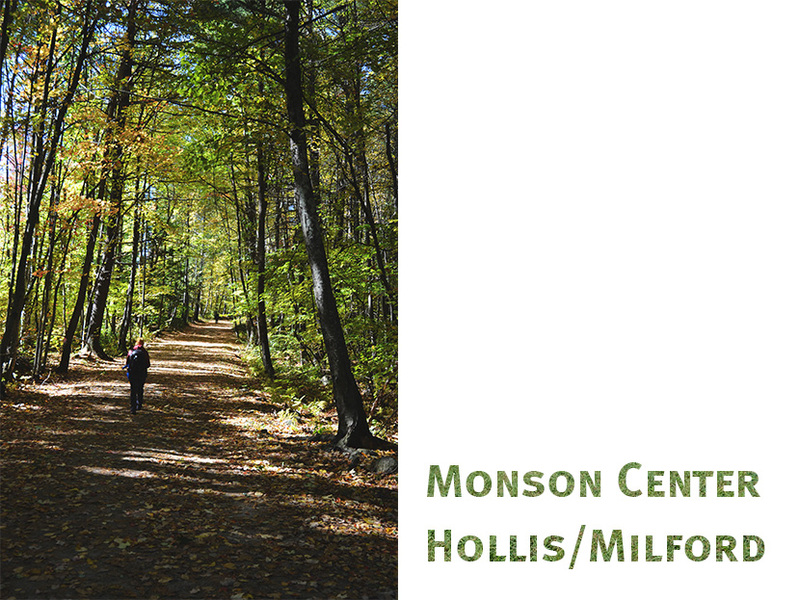 There are several narrow trails off-shooting from the main trails, but each meets up with one of the main trails, and it's easy to circle back to the center of Monson. Please note that the Forest Society does not plow or guarantee access to this property during the winter. 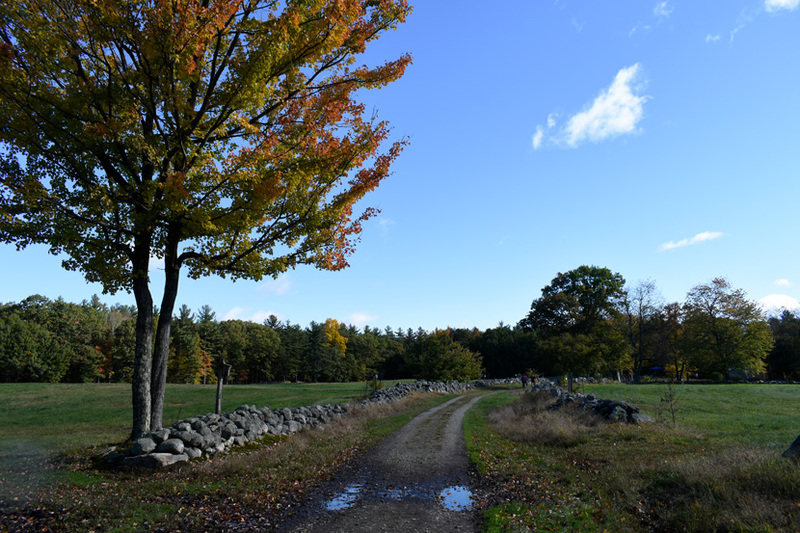 Visitors step back in time at Monson Center by walking the same rutted roads the settlers traveled. Monson photos by Mike Carrafiello (top) and Diana Talbot (above). 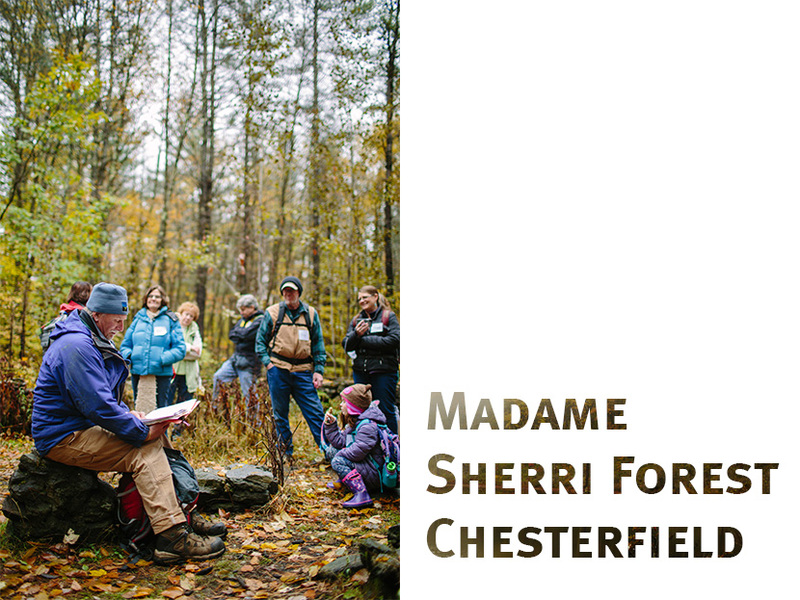 Hike Highlight: Hearing stories from Sr. Director of Education Dave Anderson who shared first hand accounts of when Madame Sherri Forest's former owner, Madame Antoinette Sherri, entertained her New York City friends at wild parties during the roaring 1920s. Fun Fact: Ann Stokes, who loved this property and its theatrical legacy, purchased it shortly after Madame Sherri passed away in 1965. She decided to permanently protect the land in 1976, when she donated a conservation easement on 488 acres to the Forest Society. She later donated the full fee ownership and adjacent castle site as an addition to create this forest reservation. Tips for Visiting: There is a small parking lot at the Madame Sherri Forest trailhead on Gulf Road. A two-mile loop trail passes by scenic Indian Pond, and other side trails lead to several longer hikes on adjoining conservation lands. From the parking lot, the foundation, chimneys, and grand stone staircase of the former Madame Sherri “castle” are just 100 feet up a short side trail. With respect to the memory of all those who have enjoyed this special place in the past: please do not alter the natural or built features of the property in any way. Do not climb on the staircase or other castle ruins, as they are unstable. Your cooperation will ensure that future visitors will have the same opportunity to experience this site’s unique cultural and natural history. 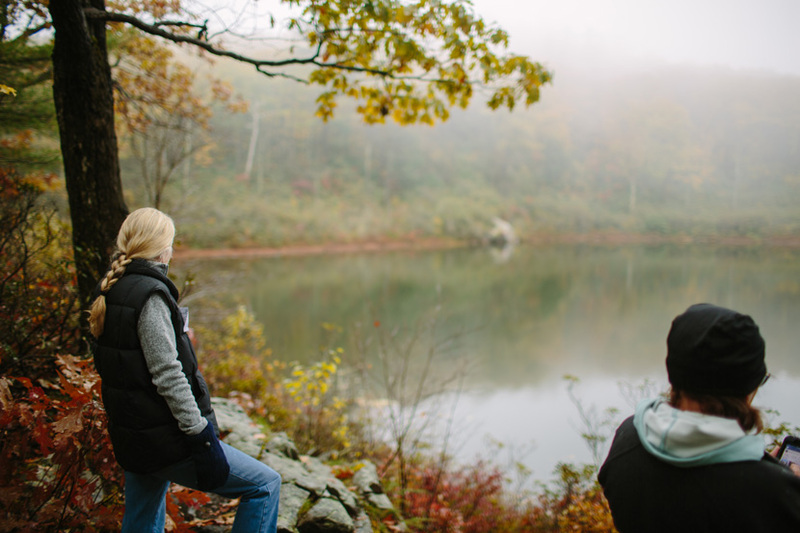 Hikers look out at a foggy Indian Pond from the Anne Stokes loop trail at Madame Sherri Forest in Chesterfield, NH. Madame Sherri photos by Emily Lord. We will hold another "Five Hikes" series during the summer-fall 2019. Join us to learn more about great places to hiking with your family or crew! Visit our Reservations Guide to plan a day in the woods or learn about land we own near you. Click here to see a map of our Forest Reservations and get directions.